Also Called: Sagewort, louisiana wormwood, cudweed sagewort, lousiana sagewort, mugwort wormwood. Stems: Erect, slender, 1 to few, simple or short-branched above, white-woolly. Leaves: Alternate, simple, sessile, variable in shape, linear to narrowly lanceolate or elliptic, 1 to 5 inches long, up to 1/2 inch wide (excluding lobes), reduced above; margins entire or tips toothed or lobed; upper surface green to white-woolly, lower surface white-woolly. Inflorescences: Panicles of heads; panicles leafy, elongate, 4 to 20 inches long, vary from dense and compact to loose and somewhat open. Flowers: Inconspicuous, whitish to yellowish; involucral bracts 10-15, in 2 series, white-woolly; ray florets 6-12, very short, pistillate; disk florets 5-12, slightly longer, perfect. Fruits: Achenes, elliptical, brown, glabrous, smooth; pappus absent; seed 1. Habitat: Open prairies, open woods, disturbed sites, and roadsides. Forage Value: Livestock derive little forage value from white sage. Uses: Native Americans used white sage in ceremonies and for purification rituals. They used the crushed leaves to treat headaches, nosebleeds, and sinus difficulties; applied chewed leaves to insect stings, spider bites, and blisters; and used the leaves as toilet paper and as a foot and underarm deodorant. 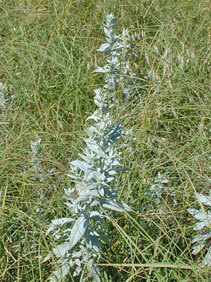 White sage was also used to treat coughs, stomach ailments, wounds on horses, and was burned to repel mosquitoes. Comments: White sage reproduces from seeds and rhizomes. It often forms colonies. White sage is highly aromatic, with a sage-like aroma. More than one subspecies of white sage occurs in Kansas.